Stephanie and her husband Paul have traveled to more than 60 Formula 1 races in 12 countries, amassing a huge collection of driver photos and autographs along the way, not to mention some priceless memories. Stephanie grew up with an interest in cars and liked watching F1 on TV, but her passion for the sport really took hold when she met her future husband Paul. Her first race was the European Grand Prix at Donington Park in 1993, famous for Ayrton Senna’s amazing first lap in the rain. “Paul bought my ticket as an Easter present. I don’t think he realised quite where that gift would lead!” says Stephanie. THE BEST RACE YOU ATTENDED? It’s impossible to choose. Each circuit is so different and creates experiences that are hard to compare. But one that definitely sticks in my mind is the 2008 Brazilian Grand Prix. 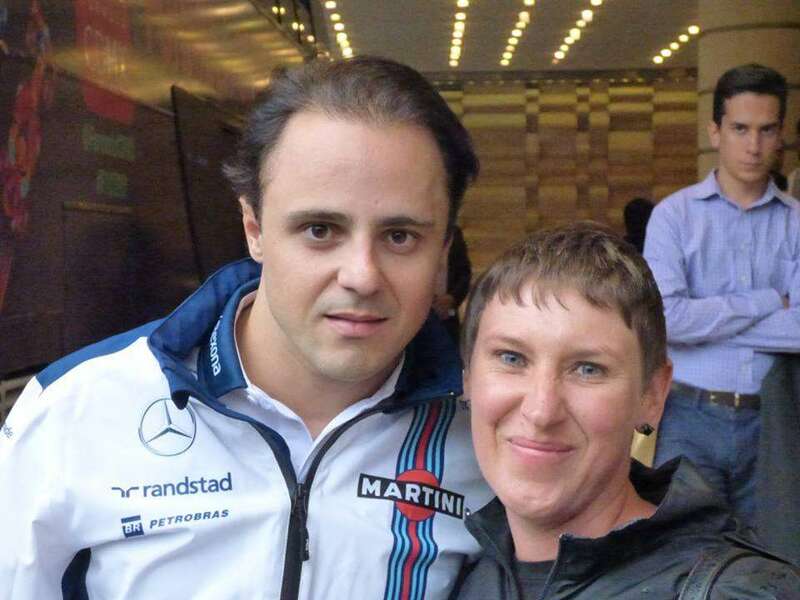 We were actually hoping to see Felipe Massa crowned champion at Interlagos, which he was for a few brief moments before Lewis Hamilton crossed the line to win his first world title. The highs and lows of that day were unforgettable. Paul’s favourite race is the 1995 British Grand Prix at Silverstone. He was a big Johnny Herbert fan and seeing him take his first win was – to quote Paul – ‘the greatest day of his life’!! Monza – because it has everything!! The circuit is full of history and passion and is set in such beautiful surroundings. There is some access to F1 drivers during the Thursday pit lane walk/autograph session and outside the paddock over the race weekend. It is also a great opportunity to catch the up and coming F2 and GP3 drivers. Add in some late summer sunshine and Italian food and wine and it’s pretty much perfect! Another difficult question and again I would say hard to choose one in particular. But our top two are probably Mexico and Brazil because alongside the F1 they have amazing cities, beautiful beaches and a fascinating culture. We really loved Japan too as it was a totally different experience. BEST CIRCUIT FOR MEETING THE DRIVERS? Driver spotting is one of our favourite activities over a Grand Prix weekend!! In our experience, the best access is at Monza and Monaco. Any circuit which offers a pit lane walk and/or autograph sessions also provides a good opportunity. The best hotels to check out are usually really close to the circuit or the five star hotels in the city. Teams and drivers tend to be creatures of habit so if you find where they stay one year it’s quite likely they’ll be there again the next. For Silverstone, some of the drivers stay at Whittlebury Hall although some stay in luxury motorhomes inside the circuit itself. Quite a few of the drivers live in Monaco, so over that particular race weekend they obviously stay at home, making their way into the circuit by scooter, cycle or boat. Don’t forget to look at the drivers in the junior categories. Formula 2 and GP3 provide a great opportunity to catch them before they are famous. They usually have more time than the F1 drivers so you often get better photos and autographs and maybe even the chance of a chat; wonderful memories to look back on. I’m tipping Charles Leclerc to be a future F1 star. He’s an exceptional talent and destined for F1 greatness. We’d also say look out for Lando Norris and George Russell, two British drivers who will surely get a shot at F1. STILL ON YOUR BUCKET LIST? Singapore and Spa are probably top of my wish list. I imagine this list will grow soon as Liberty look to expand the calendar and take F1 to new destinations. My motorsport bucket list also includes the Le Mans 24 hours, Indy 500 and the Macau Grand Prix. Too many ideas and not enough time or money!! On our recent visit Suzuka, we travelled to the circuit from Nagoya on the Thursday when events such as pit lane walks and autograph sessions are held. Being our first time, we got off when the train stopped at Suzuka, promptly followed by four other Westerners. We all stood on the platform, looking confused as there was no signs/directions and no sign of a circuit. The train conductor must have seen us, wondered what we were doing and ran down the platform to ask where we were going. When we said Suzuka Circuit, she waved us back onto the train saying, ‘next stop, next stop!! !’ We needed Suzuka Circuit Ino, not Suzuka, which is an easy mistake to make. Definitely the 2015 United States Grand Prix at the Circuit of the Americas in Austin. It was wet and cold and the queue for the shuttle bus from the circuit back to the city on race day was so long you had no idea where it ended. In terms of race tickets it would have to be Malaysia, it offered excellent value. We could see a significant amount of the track from our covered grandstand for what was a comparatively cheap price. In terms of overall value, the European races can often be done on a budget if you live in the UK. There are usually reasonably priced flights and renting an apartment helps to keep the cost of food and drink down. Been to a race and have your own story and pictures to share? Send us a trip report!